This is a simple jekyll theme based on minima. Social account can be set in your _config.yml file. This will be shown in the footer of page. Any file except 404 in root folder will be add to header, like about.md and archive.html. Set your google_analytics UA in _config.yml. Use $\alpha$ for inline formula and $$\Sigma$$ for outline formula. TODO: Write usage instructions here. Describe your available layouts, includes, sass and/or assets. Bug reports and pull requests are welcome on GitHub at https://github.com/kemingy/jekyll-theme-ink. This project is intended to be a safe, welcoming space for collaboration, and contributors are expected to adhere to the Contributor Covenant code of conduct. To set up your environment to develop this theme, run bundle install. 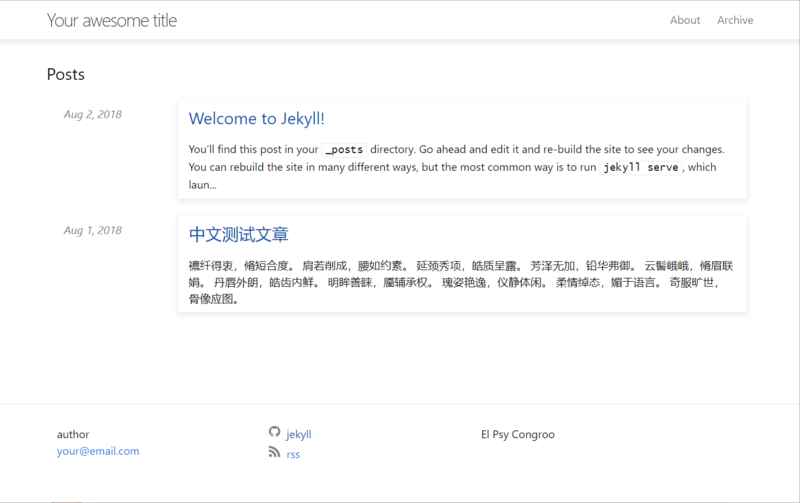 Your theme is setup just like a normal Jekyll site! To test your theme, run bundle exec jekyll serve and open your browser at http://localhost:4000. This starts a Jekyll server using your theme. Add pages, documents, data, etc. like normal to test your theme's contents. As you make modifications to your theme and to your content, your site will regenerate and you should see the changes in the browser after a refresh, just like normal. When your theme is released, only the files in _layouts, _includes, _sass and assets tracked with Git will be bundled. To add a custom directory to your theme-gem, please edit the regexp in jekyll-theme-ink.gemspec accordingly.